BIOLOGICAL SCIENCES is an exciting and rapidly developing subject area. BIOLOGICAL SCIENCES is an exciting and rapidly developing subject area. The study of living things has undergone tremendous expansion in recent years, and topics such as cell biology, neuroscience, evolutionary biology and ecology are advancing rapidly. This expansion has been accompanied by a blurring of the distinctions between disciplines: a biologist with an interest in tropical plants may well use many of the tools and techniques that are indispensable to a molecular geneticist. "Zoology has always been interesting to me. Nature is fascinating"
Zoology is the study of animals, their behavior, physiology and evolution, as well as their interactions with each other and their environment. Zoologists study how animals evolved and the impact of environmental change on their survival. They also study costs and benefits of conservation and ways to enhance species survival. It is just a basic and classical concept of our Zoology Department. Welcome to the Zoology under the Biological Science Department, Midnapore City College, established in 2017. In spite of being young, our department is trying hard to develop in all perspectives. The faculties of the dept. are enriched with research experiences from different science background. They are very hard working, enthusiastic and student friendly. Many renowned Scientists and Professors teach as visiting professor in our dept. and share their valuable knowledge with our students. They also motivate our students in research work and counsel them for their carrier opportunity. We encourage our students for CSIR-UGC NET and other top level research eligibility test. Our promise to our students is to complete the whole syllabus with deeper knowledge and we give importance on practical syllabus and impart good understanding to everyone. Our practical lab is highly equipped and sample availability is in adequate amount. 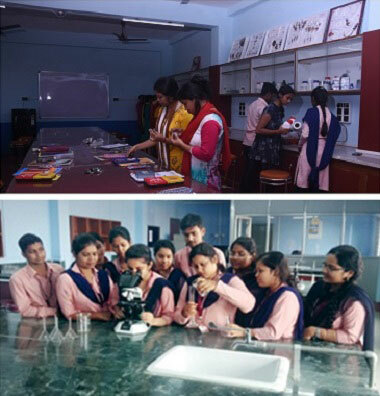 As our college is situated in an eco-friendly environment, so nature study and zoological research is easily possible. Besides, we encourage the interest of our students in basic biology linked to Zoology. Our aim is also to develop ethics and morality of students toward biodiversity to save our nature. "Botany is the science in which plants are known by their alises"
Welcome to the Botany under the Biological Science Department. With the challenges posed by environmental issues on existing flora, the significance and scope of Botany have widened. Growing world population continues to increase the need for better food supplies. Environmental concerns, such as air, water and soil pollution, will create openings for ecologists in government and industry. The search for new drugs and medicines and useful genes for improving crop plants will continue to create a need for botanical explorers. Keeping pace with the advanced knowledge, the Department has been updating the curriculum from time to time and has recently introduced the Choice Based Credit System. The Department has sufficient infrastructure facilities and expert staff members in different fields of Plant Sciences. Students are taken to botanical gardens, herbariums, museums, research institutes which help them to understand about plant diversity, plant taxonomy and state of the art research that is being carried out in different labs of repute. The department has highly qualified, dedicated and enthusiastic faculty. The faculty members are mostly engaged in research and publication to add immense value to the academic life. They provide student counseling to ensure multi-dimensional development of the students. The department mainly focuses on the areas like plant physiology, plant biochemistry, stress physiology, plant nutrition, cancer chemoprevention using natural plant products, and mycorrhizal biology. The department takes a conscious effort to expand and its teaching program bringing together novel development in the field with traditional areas of Botany through field excursion and projects. The students are coached and encouraged through remedial teaching and academic guidance. A career in Botany might just be one of the most preferred careers in India. Botany as a subject is related to the study of plants and a career in it would mean studying in depth about fungi, algae, plants, diseases, growth, metabolism and structure between different groups. When planning a career in Botany, the job profile can include study of plants, research, working with industries, teaching, self-employment, and being a part of many more fields. A person who works in this field is called as a botanist. It will be the job of the botanist to study plant life along with finding solutions to problems related to that of forest and agriculture. There are also botanists who deal with space travel agriculture, artificial environments, hydroponics and various other interesting areas of research. Cytology, Genetics, Lichenology, Economic botany, Palynology, Palaeobotany, Bryology, Ethnobotany, Phycology, Photochemistry, Forestry, Plant morphology, Phytopathology, Plant anatomy, Plant physiology, Plant genetics, Agronomy, Horticulture, Plant ecology, Plant systematic. After completing their bachelor’s education in Botany, a candidate can look forward to being a part of the industry by working as a technician, whereas, a candidate after completing his/her master’s education can look forward to working with some industry giants or being a part of good research teams. The amount of diversity in the field of Botany gives it students to choose their specializations as per their choice, aptitude and interests. There is huge scope of being a part of this industry merely keeping in mind the amount of diversity it has to offer. One can be a part of any reputed organization as a plant explorer, conservationist, ecologist, environment consultant, horticulturist, plant biochemist, nursery manager, genetics, molecular biologist, taxonomist, plant pathologist, environmental consultant and farming consultant. Welcome to the Nutrition under the Biological Science Department was established as an interdisciplinary department of study to offer course on Nutrition and Dietetics from the academic session of 2017-18. The department carries out research in areas of food science, food technology, food processing and Nutrition. The emphasis of the department is interdisciplinary study with social relevance. Nutrition is a contemporary issue, and the connection between diet and health is becoming increasingly important. The diet of the population is key to preventing illnesses including diabetes, heart disease and cancer. The knowledge and skills gathered by students of B. Sc (Hons) and M. Sc on Nutritional Sciences will prepare them to pursue a career in Nutrition, public health, health promotion or food product development. Nutritional science is internationally renowned for research on diet and health, metabolism ageing and disease and global food security. In the course of green revolution, India has stirred from food scare to food secure country. India has also come a long way improving the nutritional status of the citizens through research and development as well as through various intervention programmes. However, in spite of all the developments, prevalent malnourishment continues to hamper the development. In the last decade, problem of obesity and metabolic disorder has spreaded rapidly, posing new challenges to the policy makers as well as scientists. In the recent years, focus has been increased on food processing sector and food technology has been identified by Government of India as sun rise sector due to its rapid growth, immense growth potential and its contribution to the development of the country as a whole. Further, to cater to the needs of quality trained manpower with necessary professional skills in food industry as well as health sector and to educate work force in the field of food science and nutrition, post graduate course in Nutrition and Dietetics was offered in the academic year 2017-18. Faculties of the Department are involved in active research and constantly interact with the industry and community. In addition, they also participate in advisory capacity tendering technical advice to governmental agencies and food industry. Department welcomes prospective students to come and study in the department and also welcomes the scientists and food industry to partner in the research and development activities to develop joint programmes. "All labour that uplifts humanity has dignity and importance and should be undertaken with painstaking excellence"
Bachelor of Hospital Management aims to provide students with sufficient knowledge and skills to carry out the administrative operations of clinical and support service departments. The duration of the course is 3 years. The hospital mangers play a key role in the dynamic health care sector. They are involved in the overall coordination of activities of the hospital. They also involve in the HR activities of the hospital to identify the problems of employees and to reduce their retention. These professionals are also engaged with the computerization of important files and in the security of the same. The course study help them to identify the changing technological need of the Company and to act in pace with the same. The advantages offered by Bachelor of Hospital Management are huge. The course study imparts leadership qualities in the candidate in order to administer and the direct the operations of the hospital. The same helps one to find opportunities with public health departments, nursing homes, etc apart from hospitals. By gaining experience in the role of hospital manager, one can move in to the role of chief executive officer or head of the department of the organizations. The job position of Hospital manager offers good salary packages also. MHA (Master of Hospital Administration) is equal to and more than MBA in Health care. A suitable work experience can always give students higher employment prospects vis-à-vis a fresh graduate, quite like MBA compared to other graduates. The Masters in Hospital Administration course is meant for those people who share these sentiments, because job responsibilities range from giving astute guidance in administration to managing the daily affairs of the hospital. Efficient management can play a role in saving more lives. With the advent of medical tourism and rapid development in technologies the health sector is emerging as one of the fastest growing sectors in India. Several corporates and business organisations have forayed into the healthcare sector, thus resulting in the healthcare delivery system becoming more organised, systematic and efficient. Hence, the healthcare industry needs professionals who can handle these challenges. The programmes enable individuals to take on leadership roles by equipping them with training in planning, project and operational management, financial, material and human resource management. With a steady 15% annual growth rate over the last decade, MHA has gradually become the programme of choice for graduates who want to make a mark in the dynamic healthcare industry in India. This is also an avenue for Dental graduates and students from other Allied Healthcare streams to explore. More and more medical students are opting for MHA to enhance their career prospects for creating a niche towards managerial aspects of running hospitals/healthcare units. Also, there lies a scope beyond hospitals as well. For example, getting employed as health care program coordinators and resource persons in International NGOs (UNICEF, WHO, etc. ), NGOs and GOs. The character of the course is experiential learning, with 90 hours of training per semester. The students usually get placed prior to or during the final semester. "He who cures a disease may be the skill fullest, but he that prevents it is the safest physician"
The Bachelor of Medical Laboratory Technology a. k. a clinical laboratory science helps diagnose, treat and prevent disease through clinical laboratory tests. It is complementary to medical science. It involves analysis of body matter such as fluid, tissue, and blood. It also covers micro-organism screening, chemical analyses, and cell count. These professionals, medical lab technicians and technologists, play an important role in collecting information, sampling, testing, reporting and documenting medical investigations. Read on to know how to develop a career in medical lab technology. Technologists may also conduct research supervised by medical researchers, who are responsible for maintaining report accuracy and conducting complex tests. They generally have more training than a medical laboratory technician, who performs routine testing under stipulated conditions. Technicians may help by preparing specimens and operating automated sample analysing machines, setting up testing equipment, keeping the lab clean, maintaining tools and conditions etc. Currently the Microbiology department has 9 teaching faculty. 6 of them are doctors with MD in microbiology. The experienced, competent and stable faculty with 2 Professors, one Additional professor, one Associate Professor, two Assistant Professors, one lecturer and two tutors is an asset of this institution. Central library has many text books, Journals, both Indian and foreign and internet facilities with online databases. There is a good department library too.Medical laboratory professionals have many job opportunities in Hospitals, clinics, nursing homes, public health facilities, commercial clinical laboratories; they also find jobs in industrial research and in forensic and pharmaceutical laboratories in India as well as abroad.